Dice roller for use with FSpaceRPG or other role playing games. Is there a better alternative to d10 Dice Roller? 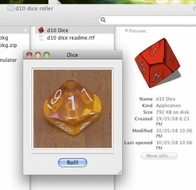 Is d10 Dice Roller really the best app in Gaming Tools and Utilities category? Will d10 Dice Roller work good on macOS 10.13.4? d10 Dice Roller... For those of you wanting a little d10 dice roller for use with FSpaceRPG or other role playing games on a Mac. d10 Dice Roller needs a rating. Be the first to rate this app and get the discussion started!